Okay, so I picked up the book yesterday and got started on it. The very first thing I noticed was how young Maric is–I didn’t realize before that he was only 18 in this book. Even in DA:O, if you just accept the default character meta profile (found in the toolset) and don’t make your own headcanons, the Warden’s 20, as is Alistair. It’s only two years, but it seems like a lifetime. Maybe the difference between Maric at 18 and Alistair at 20 has more to do with the way they were raised, rather than their actual age? As a thought on the difference being the way they were raised, the only mention so far of Loghain’s age is his impression that Maric was about “[his] age, or perhaps younger.” Loghain’s led a hard life already, and wasn’t coddled the way Maric was. If Maric is at most a few years younger than Loghain (two or three years, maybe? I can’t load the toolset anymore to get his age as of the game’s start) then the environment would have to be the difference. It would also make sense comparing their ages in the book to Alistair’s age in DA:O: Maric is the youngest at the time of introduction, and had everything done for him. He had to work for nothing. Alistair’s 20, and while I doubt he literally slept with the dogs (except maybe if he was with them and fell asleep when very young) he still had a comfortable existence; even when he was sent to the Chantry at ten, he was fed and clothed and housed. Was he happy? No. But he had a better life than most, if not as good as what Maric lived as a child. Loghain, though, never had any benefits of nobility. His father was a freeholder, and then everything with the Orlesians happened and he and Gareth became homeless bandits. That would age a kid quickly, so even if Loghain were only Maric’s age, he would seem older than Maric or Alistair at Ostagar. …Okay, wow. It took me 20 minutes, but I found MsBarrow’s “monster timeline” again. She uses the toolset’s age for Loghain since that’s the only point of reference we’re given on him, and he’s a baby–only 16 at the opening of the book! (50 at the Battle of Ostagar). Granted, not everything in the toolset was up to date when it was released (Alistair’s age, for instance) but since it’s the only mention there is, it’s what we have to go with. So that puts even more emphasis on the idea that Loghain’s apparent age is influenced by his life, I guess; he’s two years younger than Maric but his first impression is still that he’s probably older. Loghain’s gut is never wrong. He reminds himself of this fact constantly. For later reference because I’ll probably need it: The book starts in the spring, and a cold one at that. Not sure if that means just that it’s cold because it’s very early spring, or if the cold is just lingering extra long. Geography and travel times are a bit muddy, but that’s to be expected. I think I have the general direction of the bandit camp right (southeast of Lothering, and close enough to the town that its constable is the one responsible for the region) but the distances to the Southron Hills and the Wilds is a bit off. I don’t care how good Loghain is–he’s not going to get from the northwest edge of the Hills, through the Hinterlands, and into the edge of the Wilds in a day and a half. I forgot the Sister in the camp is the same Ailis from the next book and from a few of the codexes in the game. Also, Maric notes that Ailis’s robes are red, which matches the various designs in DA2 and Inquisition. So why were they changed in DA:O? I need to remember to grab a mod for my game with a red version of the robes for all the priests. I’m really confused how Loghain knows what jasmine smells like. There’s no way it would thrive that far south, if it would even grow at all, and I doubt 16 year old Loghain’s been to the northern coast where it might grow (but even that’s not certain). I’ll have to assume it’s the example used just because it’s the fastest, most accurate way of describing the scent to us as readers. I choose to believe that the Dalish clan is Sabrae, even though I don’t think which clan they are is ever mentioned. Maric and Loghain encountered them on the edge of the Hinterlands (somewhere southwest of the Brecilian Forest) and they specifically were aware of and obedient to Asha’bellenar, who lived nearby. Add to it Marethari’s history with Flemeth (who helped her with her vengeance after an Avaar attack) it’s all just convenient enough for me to go with this theory. Anyhow… I think that’s everything of note from the first three chapters? I had a few other notes, but after letting them settle a day they don’t seem as relevant or stand-out as these. I’ll go through a few more chapters soon and put up what I notice soon, though probably not before jumping over to FF or something briefly first. It just occurred to me, probably because I just posted about A King’s Tale: Final Fantasy XV, that 30 years seems like it might be a standard flashback or prequel time frame. Star Wars: Episode One does the roughly-30-years-thing, too. That’s not really relevant to any of what’s to come, just something I noticed as I was about to type out the first sentence of this post. Anyway. 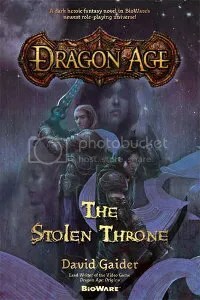 Dragon Age: The Stolen Throne. Takes place an ever-convenient 30-ish years before the opening of Dragon Age: Origins, the actual introduction many if not most of us at this point had to the series. Where each of the games in the series can more or less be experienced without the other installments first, this book needs Origins and vice-versa. I’d played both Origins and Awakening before reading either book, and without the game I wouldn’t have been able to place myself in the text as well as is really fair. But it works much the same the other way around: there is so much about the game that I didn’t really appreciate until reading this book well after the fact. The book, of course, is all about how the then-exiled-Prince Maric reclaims Ferelden from Orlais. Going into my first read of the book, that’s literally all I had to go on. Looking back before starting my re-read, the biggest impression it left on me was my entire view of Loghain. From almost the first moment, he was actually relatable; completely unlike how he’s presented to us in the main game without any meta knowledge from this book or any other sources. We get to see him as a human, instead of the has-been Hero of River Dane of the game; it’s just one thing that could have/should have been part of the game itself, if not for pacing and resource budgets. The second biggest thing I remember is being confused by the geography mentioned throughout. It doesn’t help that the map used in the book is an earlier version of Ferelden’s map, one that was changed before the final game was released. Even Redcliffe is in a different position than it is on the games’ maps. But between the book’s map’s differences and the book mentioning Very Important Events happening in places I’d never heard of, it was all very confusing. But in the time since I last read this I’ve done some tinkering with all the versions of all the maps that I think will help me out this time. And so? Into the book I go. I don’t plan on pushing myself through this process at a rate that’s going to burn me out, so I only have the post formats I plan on using set up and not a schedule. Book posts, at least, will cover whatever meaningful chunks of content I’ve reached by the time of the post. That could be a chapter or chapters, it could be a day’s or week’s worth of reading, or it could be something else entirely. It’ll all depend on that moment. Game posts, later, I have a little more structure for, but as I said–that’s later.